A white dove release is a wonderful way to celebrate a new beginning for the married couple! We have a wide variety of wedding packages to make your wedding day unique and memorable. We'll even supply poems to read before the release ceremony. Whether you are having a traditional church wedding or an outdoor wedding, a white dove release will enhance the experience of your special day. 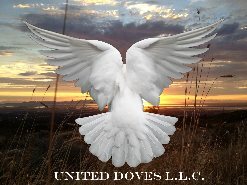 From the beginning of time, doves have represented love, peace, purity, and fidelity. Doves are the perfect symbol of a marriage because they choose their mate and are faithful to them for life. Traditionally, the release is performed as the bride and groom exit the church together, with your guests outside awaiting your appearance. This is often done instead of throwing rice or birdseed. The release usually is performed after vows are exchanged and you are introduced as Mr. and Mrs., though we can personalize any release. This release of white doves enriches the moment as your guests applaud your union together. We work with many wedding planners who will be happy to assist you in scheduling your Dove Release. The doves cannot be released inside. However, we do offer a variety of dove display cages for indoor use. Please visit the page for the franchisee nearest you to find out what displays are available. TO VIEW OUR PRICES, PLEASE FILL OUT OUR INQUIRY FORM ONLINE AND FOLLOW THE PAGE INSTRUCTIONS.